Dimensions 1 by 4.75 by 7.75 in. Writing poetry and inspecting artillery bombs for the army do not seem like compatible endeavors, which is perhaps why many biographers and critics have overlooked Edgar Allan Poe's stint in the military, dismissing it as an odd aberration in his literary career. William F. Hecker, however, is in a unique position to appreciate the influence that military culture and training had on the young poet. A professional artilleryman and a Poe scholar, Hecker offers a lively, nuanced account of Poe's experience as an enlisted soldier and West Point cadet and relates it to his writing, especially his Poems (1831), presented here in facsimile for the first time since 1936. Military service appealed to Poe's romantic sense of adventure, and in 1827 he joined the army under the name Edgar A. Perry. He rose quickly through the ranks -- most notably learning cannon drill -- but suffered as a social misfit in the field and at West Point, where legends about a brilliantly defiant jester still abound. Shortly after being dismissed from the Military Academy for neglecting his duties, Poe published his third book of verse, Poems (1831), which he dedicated to his fellow West Point cadets and funded through subscriptions to them. Hecker explores these events, filling in biographical gaps and drawing connections to Poe's poetic vision. Poe's desire that his poems act as aesthetic bombs -- deranging the senses, striving for Beauty but failing explosively -- emerges as a key theme. 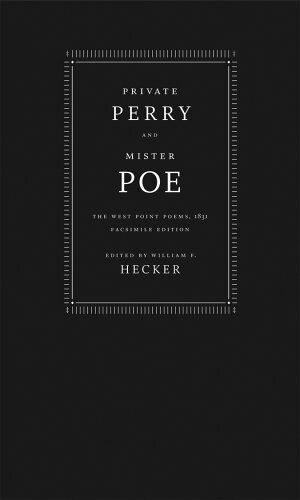 With a foreword by poet and Poe critic Daniel Hoffman and an afterword by Gerard A. McGowan addressing the martial element in the poems "Tamerlane" and "To Helen," among others, Private Perry and Mister Poe offers the definitive statement about Poe's military experience while making the early versions of many of his most famous poems widely available. About: Writing poetry and inspecting artillery bombs for the army do not seem like compatible endeavors, which is perhaps why many biographers and critics have overlooked Edgar Allan Poe's stint in the military, dismissing it as an odd aberration in his literary career.